Dafney Dubuisson Stokes is a Senior Associate and Supervising Attorney at Wong Fleming. Prior to joining Wong Fleming, Ms. Dubuisson Stokes worked with municipalities and school districts in 23 counties throughout the Commonwealth of Pennsylvania in their delinquency collections efforts. Ms. Dubuisson Stokes has also provided representation in the areas of civil liberties and criminal justice. 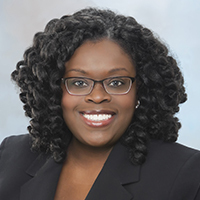 In law school, Ms. Dubuisson Stokes served as a judicial intern for Magisterial District Court Justice David R. Strawbridge in the Eastern District of Pennsylvania. Her responsibilities included reviewing reports and recommendations and editing draft opinions in the area of Social Security. Ms. Dubuisson Stokes also became certified in domestic relations mediation and volunteered at the Philadelphia Court of Common Pleas Family Division where she used her conflict management and negotiation skills to assist estranged families. Prior to a career in law, Ms. Dubuisson Stokes worked for almost a decade in the social service sector advocating for and providing services to at-risk youth suffering from severe emotional and behavioral difficulties. “Panel: Make FJD Debt Collection Fair, Practical” (Philadelphia Bar Reporter, Opinion, March 2013).